The 27 holes of this Golf course offer a sweet mix of calm and space amongst the woods and meadows of the countryside behind Deauville. There are three courses with 9 holes each. The 27-hole course (two courses) designed by Bill Baker offers everything that an ambitious golfer could wish for. Water obstacles, challenging greens, perfectly trimmed fairways and beautiful scenery. The elegant club house offers everything from a Pro Shop to a restaurant. Between half-timbered buildings and white apple blossom, work on your swing in the serene setting provided by Barrière Golf Saint-Julien. Enjoy the two beautiful courses, an 18-hole and a 9-hole, in the romantic Normandy countryside. At St. Julien both professionals and amateurs get their money’s worth. Enjoy sumptuous views of the sea and countryside across 70 hectares of magnificent landscapes. A succession of technical subtleties offer you a chance to perfect your game in all seasons on one of two courses at Barrière Golf Deauville. 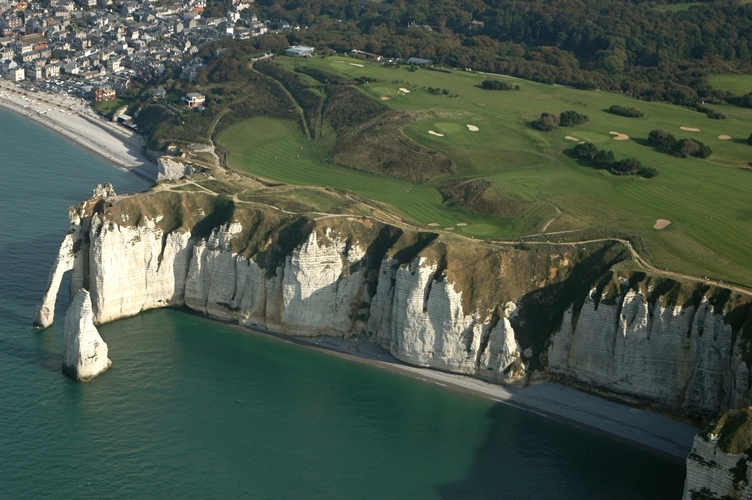 The Etretat Golf is a 18 hole golf course between Ciel & Mer, that has been founded in 1908. Located in stunning surroundings, the golf course overlooks the sea and the bay of Etretat. Omaha Beach golf has 2 courses, each with 18 holes with different landscapes between land and sea. You can choose between “La Mer-Par 72” overlooking the sea and “Le Manoir-Par 71” with it s many ponds in a typical Normandy environment. This course offers challenging golf at one of the world’s most historical beaches.